When a child is lost, the sorrow is shared; everybody whom the child was dear to feels the pain, and the desire arises to share the burden of such incomprehensible loss. The loss of a child. A child dies. A small soul passes away. Whether it be due to miscarriage or unforeseen events in the years of youth, the finality requires gentle thoughts and mindfulness regarding the hope and expectations now forever removed from the future. At this unfortunate timing, perhaps above all others in the milestones of life, it is almost impossible to find the right gesture to capture exactly the right tone and emotion. You want to buy something for the grieving family, but what is appropriate? What can you give that holds your tenderness towards offering to carry some of the burden of this loss? Sympathy Loss of Child Gifts by Captured Wishes will meet your desire. Losing a child, be it a miscarriage or events beyond control for the passing of a young life, knows no boundaries or rules when it comes to emotions. Captured Wishes has created this precious tear-shaped wish vessel. It comes complete with verse and description of the symbolism captured with the tears. All you need add is your love and signature. This tear-shaped Wish vessel, filled with holographic blue resin glitter is designed to symbolize the child's passing and becoming a Forever child. 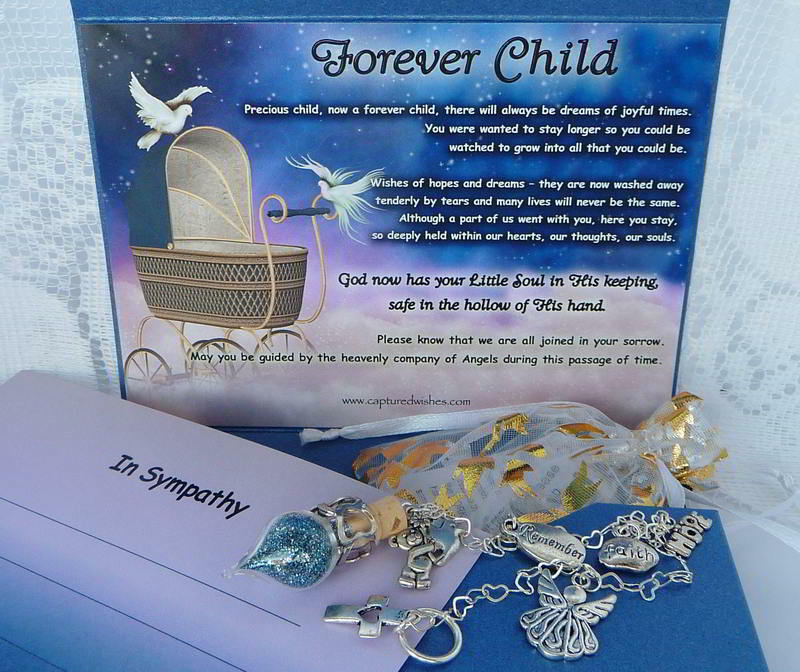 This delicate and small sympathy loss of child gift from Captured Wishes makes the connection. Carefully chosen to offer comfort and express your desire to help and share during this difficult time, the words in this verse card are timely and tinged with your sorrow for the loss of a small soul. The vessel and accompanying verse arrive in a self-contained gift packet to either open and display or to be saved and preciously stored by the grieving parent/s - taken out when needed. Grief is personal. Sharing sorrow is personal. This gift fills the void. The tear-shaped bottle (35mm height x 15mm wide) comes complete with a suction cup for display in a window or on a mirror to catch the light.